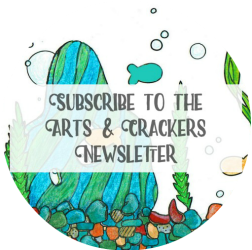 Your child probably has a pile of fridge magnets–animals, numbers, letters. They are probably stored on the fridge. Personally, I like to keep my fridge free of too much clutter so I came up with a solution for this magnetic mess–a fridge magnet organizer! 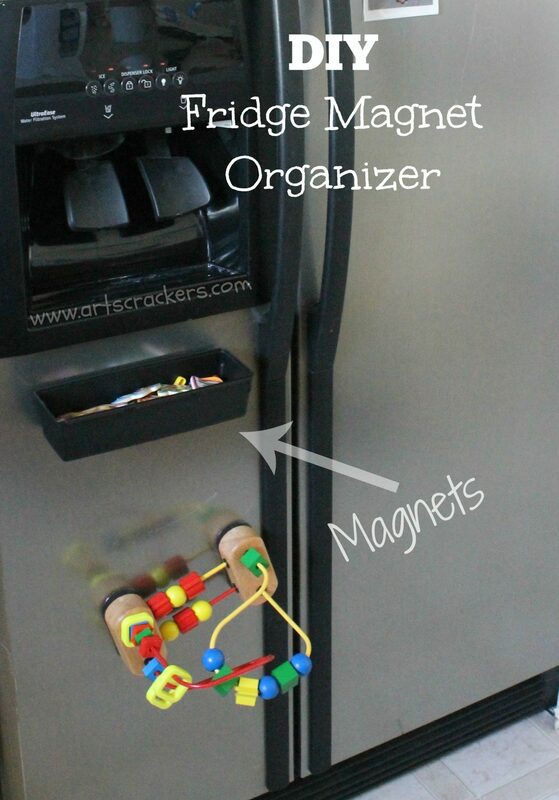 This magnet bucket will help to clean up the front of your refrigerator, but it will also provide an opportunity to teach your child(ren) to clean up after they are finished playing as well as keep small magnet toys out of reach from your younger kids. 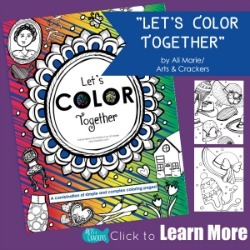 You can use this magnet organizer for more than just ABCs and 123s as well; it works well for keeping some writing utensils available or a few recipe cards. Keep in mind that the amount of items you can store in your magnetic refrigerator organizer depends on the item weight, container size, and magnet type/strength. You will want to use a bin that is not too deep (in how far it protrudes from the refrigerator) so it does not stick out too far but also so the magnets are able to keep the bucket in place properly. 1. 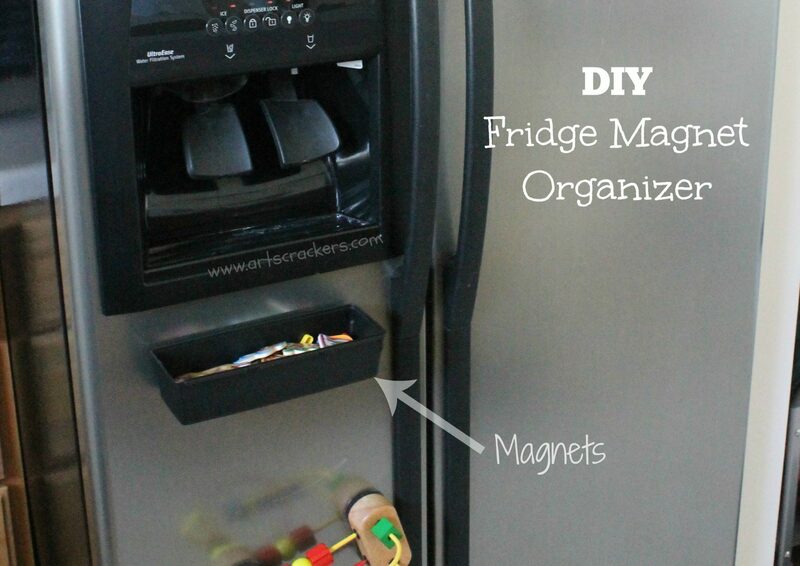 Find out where you want to place your magnets. 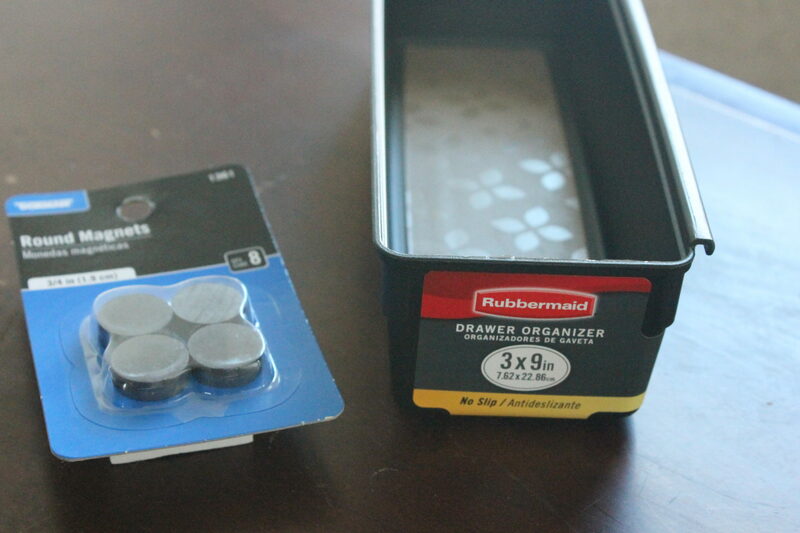 For using the round magnets, I found it best to place them at the top on either side and in the bottom center. If there is a lip on your container, make sure you place the magnets on the flat side or that they are wide enough to pass up the lip. 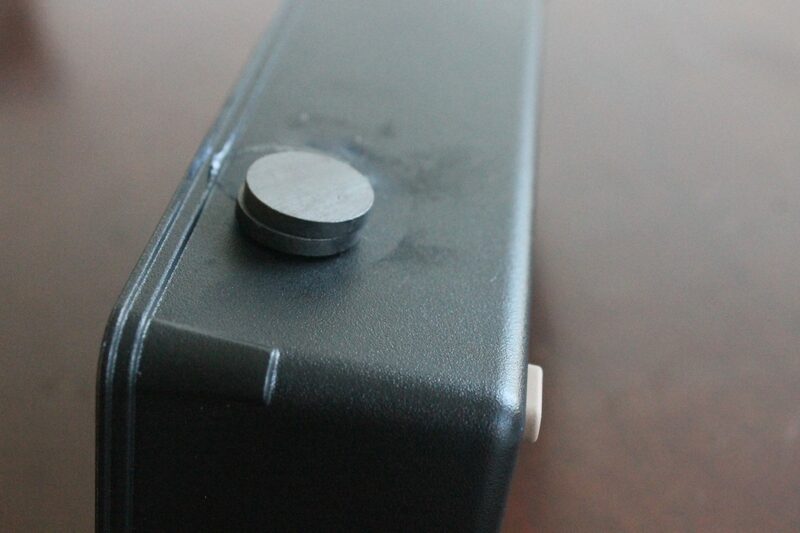 You will want to measure to ensure the magnets are even with each other. 2. 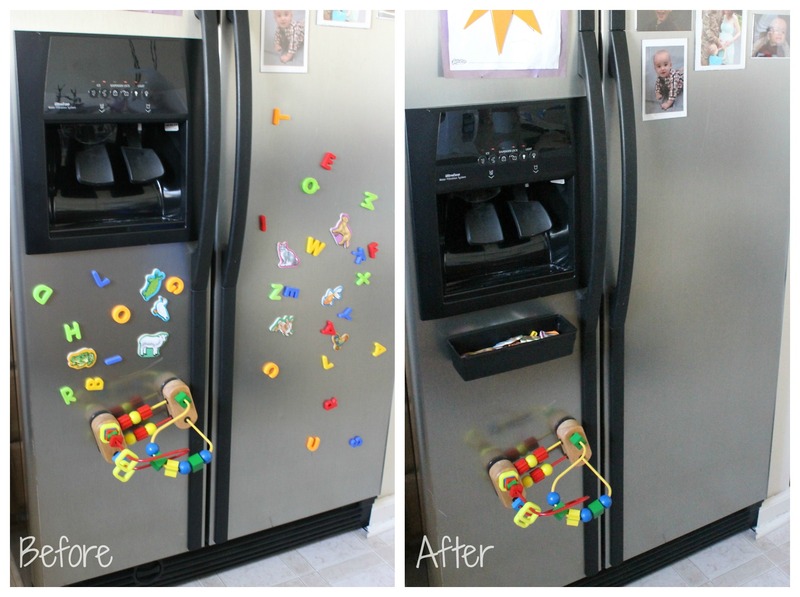 Glue down the magnets. I used hot glue for this to keep it simple, but if you can use a stronger glue, use that. A tight bond is important. *Note: if you are using the button magnets or multiple of any magnets, and putting them close together, make sure they “agree” with each other. 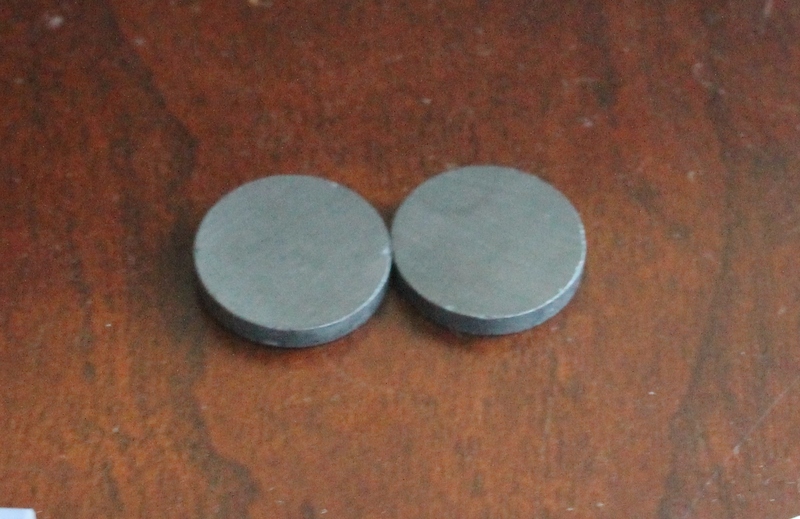 Magnets have two poles and if you do not make sure they attract first, they will not stick properly. 3. I found that one each of the round magnets was not strong enough for all the little magnetic pieces we were needing to fit inside so I doubled them up. 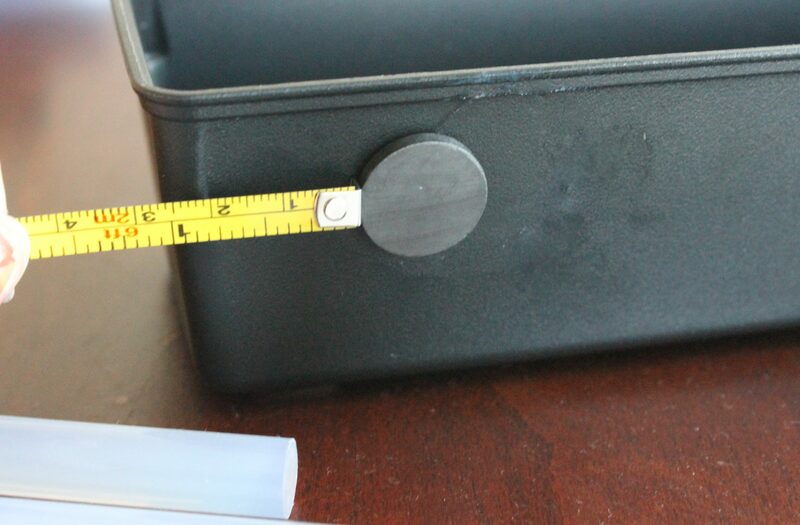 Add glue in between the magnets for a tighter fit (I recommend super glue for this step as it will make the bond stronger–my son peeled the ones connected with hot glue apart. )*Note: magnets have two poles–make sure when you are connecting the magnets that they are pulling together rather than pushing apart or they will not stick together. 4. Let the glue dry completely; it should dry fairly quickly. I would still recommend waiting at least an hour before using the magnetic organizer for the refrigerator door. 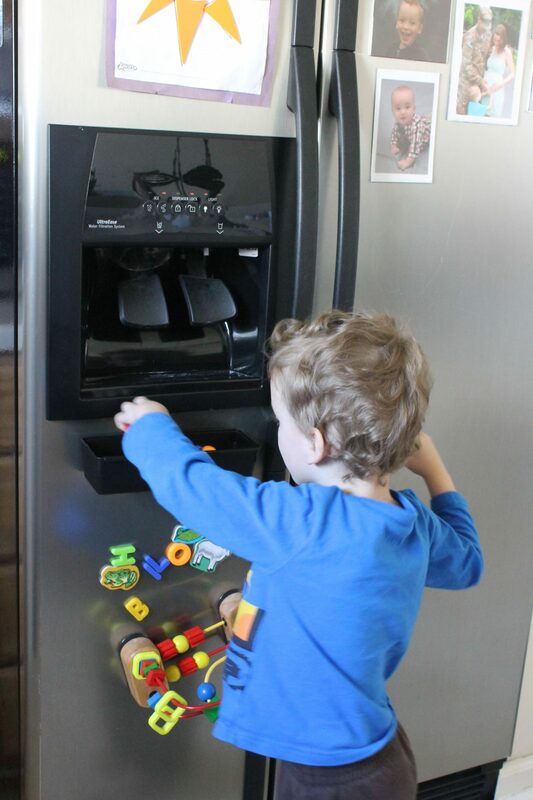 You can, however, test the bin briefly to make sure that you have enough magnet strength to hold up the bin as well as the magnetic alphabet letters or other magnetic toys you are trying to hide away in case you need to move magnets or add more. ^^^And yes, my son stuck a suction cup toy to the fridge and I was not having the easiest time removing it so I just left it. It’s OK to laugh. -Are you going to try this? Share your pictures on my Facebook wall! Check out my easy bath toy organizer HERE. 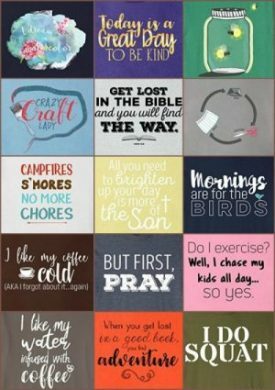 DIY, home, kitchen, magnets, organize, refrigerator, reuse, toys. Bookmark. My OCD child would probably love this! (And her OCD momma too 😉 ) Great idea!! Thank you! Hope it works well for you! I do not like a mess on my fridge so it is great!